years back she wouldn’t even consider wearing a handwoven Banarasi sari or lehenga for any one of her wedding functions. 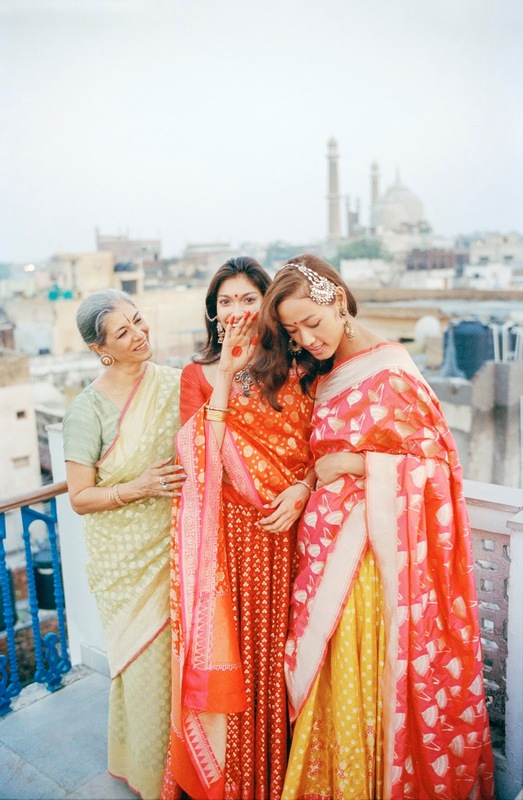 Afterwards, even when her mother-in-law passed on several of her heirloom saris to her, she kept remarking that though each one of them were exquisite she would drape them once she was older. “As I kept looking at the saris I wondered why I did not identify with them despite each being so pretty. Then it dawned that they were too ornate and heavy for my taste. But the fabric, the intricacy of the weave, the zari and the stories behind them were so fascinating. As a young girl I wanted something lighter, finer and in a pastel shade. I went back to the weavers in Banaras, with whom my family has been working for the past 150 years and charted a different design module. 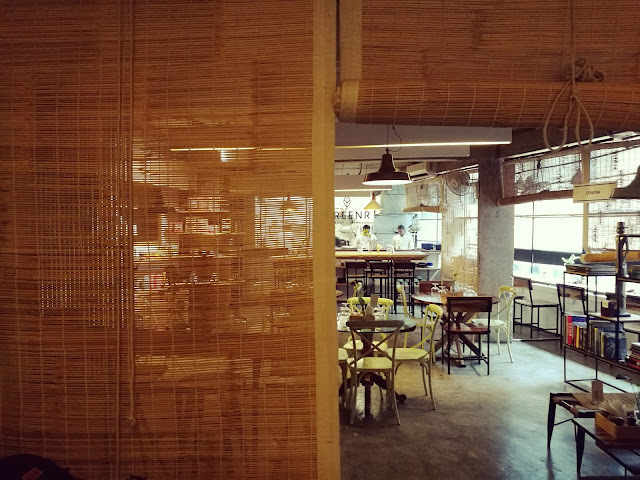 Once I recognised the mastery of the craft and the magic of the weaves there was no looking back,” relates Gupta from her studio in Shahpur Jat, Delhi’s quaint yet busy fashion hub. world charm of the town; its simplicity, rustic candour and vibrant exuberance. In a clever spin, Gupta has been able to infuse that air into the clothes. Pretty pastels play with their bright cousins even as the intricate zari work lend a subtle sheen to the saris, dupattas and lehngas. 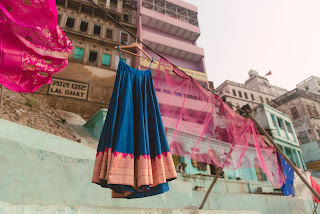 Gupta’s family is one of the oldest to work with the weavers of Banaras making stunning fabrics and saris. Banaras House in Connaught Place is their old retail showroom. When Gupta brainstormed with her husband about the presence of a young line at the store, because her thoughts resonated with several would-be-brides she met, the couple decided to launch Bageecha. “We referenced from the old books that my grandfather collected. These chronicled the designs that the old weavers created. We have retained those designs but uncluttered them to a certain extent to make the get-up more contemporary and chic,” elaborates Akshay. For instance, while many of the old weaves were heavy with labyrinthine jaals, junglas and bootis, Gupta cleared them up for a frothier effect. 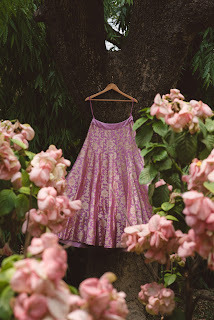 Patterns like the teen moti, haatis, totaas, paanch patti and Mughal bootas from miniature paintings have been merged with candy pinks, mint greens and blush to give them that ebullient yet stylish kalis. Initially the weavers were sceptical about lightening up the designs but Gupta says that when they saw that prospective brides were gravitating towards the final result they were motivated to innovate. Often, the weavers, in towing the populist line, lose the original essence of the ancient designs. Earlier, the warp and the weft were interlocked to achieve patterns that were absolutely sinuous. In the march of commercialisation the new designs were more in-your-face, lacking the maze-like finesse. “The artisans refer to the word mahim which means intricate. In all our motifs, we ensure that this detailing is retained because that is what heritage is all about. The finer the weave, the more luxurious it is. We work with a lot of floral and animal motifs because earlier those were the predominant picks. The shikaargah has been popular but we have infused novelty into the art by offering it in peppy colours. 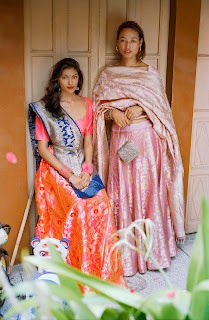 Young girls opt for a fluorescent pink, coral or a lovely firozi instead of the usual Banarasi hues. We have a piece in peach that has cherry blossoms woven into it. The zari work stands out on red. We ensure our reds to be modish with a unique version of the aara motif. The ancient barfi jaal has been restructured to attain an unostentatious yet stunning form. These do well for bridals. seedha pallu as it’s graceful. 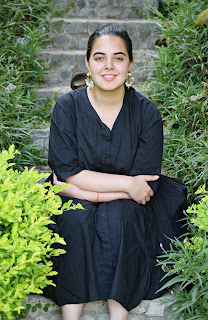 There’s this timeless appeal in going vintage,” opines Gupta.